Hey, lookit all the new jobs! Hollywood makes another try with Atlas Shrugged… second-guessing Jim Rickards… a “nonelitist” reader’s complaint… and more! “I remember one family,” recalls New York physician Diane Meier, “where one of the daughters had the responsibility for caring for the mom who had Alzheimer’s disease, and she provided wonderful care to her mother for more than 15 years. Amount of that total covered by Medicare: just under $100,000. To those figures, we add a new one this morning: $56,290. That’s the average cost of care, per year, incurred by an Alzheimer’s patient — or, if the patient’s savings are exhausted, the patient’s family. So says a study out this week from the University of Utah, sponsored by the National Institute on Aging. As it happens… you can act this afternoon to secure your financial situation in retirement… and capture the gains from the first successful Alzheimer’s drug this century. Many have tried and failed — including pharma giants Eli Lilly and Pfizer — usually by going after the “amyloid plaque” that gunks up the brains of Alzheimer’s patients. But for eight years, Ray has been following the progress of maverick scientists at a tiny biotech going after “sigma receptors” that lie at the edge of a cell’s membrane. That is, the drug reawakens the body’s ability to repair damaged cells — and to great effect. Early results from a Phase 2a trial showed improvement in 83% of patients — and that was before the researchers figured out the optimal dose. And in only five weeks, patients showed 38% improvement in measured cognitive function. The near-term profit potential? Put it this way: One Alzheimer’s drug had yearly sales of about $2 billion before it went off patent. That’s five times the market cap of this company. There’s still time to review Ray’s research and decide for yourself before day’s end. Here’s where to get started. To the markets — where it’s all about the job numbers this morning. It being the first Friday of the month, the Bureau of Labor Statistics is regaling us with its monthly nonfarm payrolls report. The wonks conjured a crazy-good number — 271,000 new jobs for October, and all but 3,000 of those were in the private sector. The “expert consensus” was counting on 190,000. Even the real-world unemployment rate from Shadow Government Statistics — running the U-3 number the way it was in the 1970s — is now the lowest in three years, at 22.8%. The labor force participation rate — the percentage of the working-age population in the labor force — remains mired at a 38-year low of 62.4%. But it’s the 271,000 new jobs number traders are fixated on. Conventional wisdom says the number removes all doubt: The Federal Reserve will raise its benchmark Fed funds rate next month. Stocks are generally in the red, though not dramatically. The S&P 500 is down two-thirds of a percent, at 2,087. Of course, you don’t come to us for conventional wisdom. So we can tell you the 271,000 number doesn’t alter Jim Rickards’ calculus about the Fed leaving rates alone next month: As he said here just yesterday, unemployment isn’t the only thing the Fed takes into account. It also considers GDP and inflation — both of which are below the Fed’s desired targets. Besides, one month of good job numbers doesn’t constitute a trend. The last three months put together still look disappointing… and there’s one more jobs report due before the Fed meeting. And… all that dollar strength today puts the Fed in a bind. Raise rates now and it sets off a wave of debt defaults in emerging markets that could easily boomerang stateside. True, after a whole year of all talk and no action on rate increases, that could send markets into a tizzy. Maybe this time Hollywood can do Atlas Shrugged right? Albert Ruddy, a film and TV producer whose credits include The Godfather, has won a 40-plus year battle to acquire the film rights for Ayn Rand’s 1,368-page paean to liberty and entrepreneurship. Ruddy tried to convince Ms. Rand in person in the early ’70s, but her insistence on script approval was a deal-killer. Many rumors of a movie or TV miniseries surfaced in the decades after her death, in 1982. In the end, the task fell to John Aglialoro, the CEO of treadmill maker Cybex. He produced a trilogy for theaters. The first installment in 2011 had a budget of $20 million and grossed $4.6 million. By 2014, the third installment was produced for only $5 million and grossed $847,000. Different actors portrayed the main characters in each of the three installments. “You shot the book, not the movie,” Ruddy recalls telling Aglialoro. And thus Ruddy convinced Aglialoro to sign over the rights. Ruddy figures on a six- or eight-hour TV series, probably for distribution on Netflix or a similar streaming service. Expect the novel’s 1957 railroad context to be brought into the near future. “When you look at guys like Jeff Bezos, he’s not only doing Amazon, he wants to colonize Mars,” Ruddy tells The New York Times, waxing enthusiastic about a strike by the innovators that leads to an Internet blackout. The project sounds like a go. Can the Angelina Jolie as Dagny Taggart rumors be far behind? “I’d like to say that I do find The 5 useful and make a point to read it every day,” a reader writes. “I’m also a big follower of Jim Rickards because I think he is a rare voice of truth in the midst of madness. 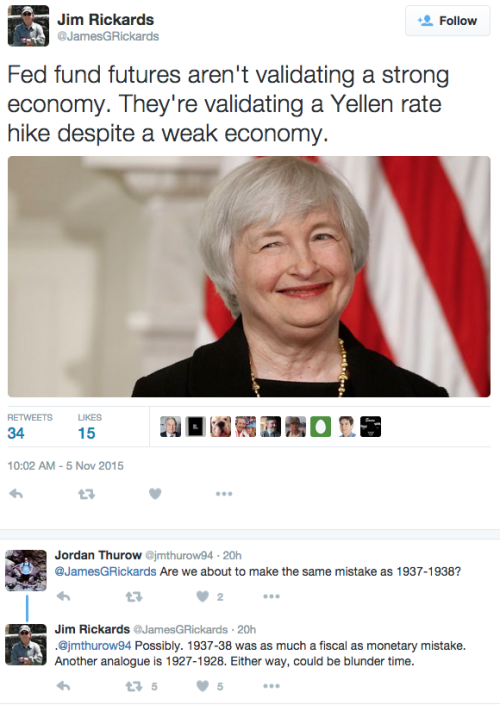 “‘Could be blunder time’ seems to indicate that he believes a December rate hike is now a real possibility. The 5: Heh — Jim never rules out the possibility of a Fed blunder. Was he trying to have it both ways? Hardly. Jim wrestles with probabilities in a world with few certainties. And you can never dismiss a low-probability event as long as the probability is greater than zero. Rest assured we’ll be on Blunder Watch from now all the way through the next Fed statement on Dec. 16. “They have the ability, but not the courage, to either change what the Federal Reserve does or cancel its charter. But this would be cutting off the gravy train that allows them to stay in office, so they don’t do it. “We no longer have people such as Paul Volcker, or even Jimmy Carter, in government. Men who had the courage to act, knowing it would cost them their careers. Jimmy Carter may have helped inflation along in the ’70s, but he didn’t stand in the way of Paul Volcker prior to the 1980 elections when he raised the interest rates at the Federal Reserve, which all but doomed any chance Carter had at re-election. The 5: We’re sorry if the cost of Ray’s premium research is out of your reach at this time. Ray does have an entry-level newsletter that’s more accessible. We try to serve as diverse an audience as possible. So most of our editors have an entry-level publication that’s suited for smaller and more conservatively invested portfolios. They also have a premium advisory service that aims for much bigger gains in a shorter time frame. Researching those premium ideas requires more time and expense — whether it’s Byron King jetting off to Madagascar to check out a graphite mine or Jim Rickards attending a conference in Malaysia to get the skinny on who will fire the next shot in the currency wars. Or in this case, Ray Blanco spending eight years following the maverick scientists who might well stun the world tomorrow with the prospect of an Alzheimer’s cure. And we charge more accordingly. With any luck, the gains you make from our $50-a-year newsletters will be enough that you can move up to the higher-end services. That’s our fervent hope, anyway — both for your sake and ours! P.S. Clock’s ticking — if you want the biggest possible gains from the first drug of the 21st century that can make a meaningful difference for Alzheimer’s patients — the time to act is this afternoon. Click here to begin.